My husband’s aunt actually made something very much like this and served it in a ring mold with a cup of Miracle Whip type topping to spoon on the salad. I enjoyed it! This is my 88 year old Aunt’s standby potluck recipe. It’s actually really good. Think lemony sweet & sour coleslaw! Have you actually tried it? Or were you just pretending to be a child? Be a child all you want. This made me laugh! Had something like this all the time growing up! I actually loved it, even as a kid. Ours had no pimentos or green peppers, sometimes had shredded apples, and was usually lime flavored. I’m vegetarian now (gelatin is not vegetarian) but if I had a vegetarian version made with agar or something I would eat it again. Wow. Gelatin and pimientos were hot in the ’60’s. I’m sure it doesn’t taste horrible, but it absolutely looks it. 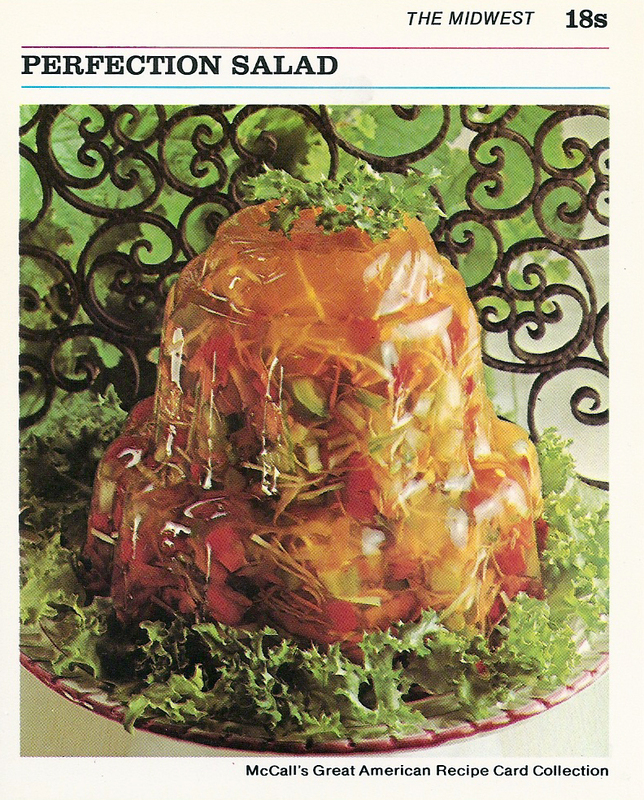 I never understood the appeal of food encased in gelatin. It just looks sad. And trapped. And gross. I remember this recipe — it was something called Aspic — I thought it was pretty good, but I also liked school cafeteria food too. actually, aspic is made with a meat stock and the base for meat or seafood. gelee (jelly) is similar and that is what Perfection Salad is. it is lovely and i had it at the famed Camelback Inn in Scottsdale, AZ. the idea is quite French and still used today by great chefs. check out the Netflix documentary about Great Chefs and you will see them make gelees. i don’t care for pimentos so i would probably substitute red peppers which would take care of the required pimentos and green peppers. i like the idea of using apple juice…that is unique in this recipe and the acid is reversed quantity, i guess to make up for the sweetness of the apple juice. it is usually 1/2 c. vinegar:2 T. lemon juice. love your remark about school food. two i recall that were superb….one was the best mashed potatoes with some sort of hamburger in gravy in the well of the potatoes. that was before instant when the cooks cooked (a long time ago) and since it was in the South, they knew how to make gravy. The other was so weird….a sandwich of american cheese (which i cannot abide now) with mayo and one (1) hamburger dill in the middle. everyone ate around the pickle, saving it for last. i continued to eat this delight for many years as an adult but changed to cheddar. for some reason, it didn’t occur to me until late in life that i could afford to ‘pickle’ the whole darned sandwich. slow learner. Just in case you were wondering where the salads where on my blog – shall we start here……. I’m making this for a retro ladies’ luncheon this Saturday. I’ll let you know how it turns out. Unflavored gelatin is a new frontier for me. my husband had this as a kid. it made him throw up. just looking at the picture made him throw up a little bit again. Ah, memories! My mom made perfection salad when it was a ‘special occasion’ meal, but usually in a ring mold with (as another poster described) a bowl of Miracle Whip in the center. We all liked it—-you might, too, if you could get over your preconceived notions! This used to be a must have at our church dinners when I was a kid! It looks like something that would attack you in the earliest levels of any random RPG.